The Official Mort Künstler Blog: "...and the Generals were brought to tears"
"...and the Generals were brought to tears"
I am writing this to you, with provoked emotion, in regards to your painting entitled “The Generals Were Brought To Tears.” I saw this beautiful picture once, years ago, and I wanted to share the reason I have found such profound identification in your works, most indiscriminately this one in particular. I am a 28 year-old medically retired Army Captain, and was once a tank commander and platoon leader for the U.S. Army in Iraq. On January 26, 2006 I, an officer in 4th Infantry Division, was leading a platoon of soldiers from the 101st Airborne Division. The chance of attack was imminent, and I knew this as well as any man out there walking with a rifle, and with our heads, individually, on swivels. I told a young private from the 101st to get behind me once I realized he was becoming nerve-racked in anticipation of the imminent roadside bomb that would meet us with a smile of shrapnel ahead, which is precisely when I took the lead of the formation. Some will say this was an act of bravery, but I assure you it was not, as I was almost entirely selfish in this act. I could not bear to see any soldiers wounded or killed, if I could prevent it. So, I shielded them all with my own body, and within one kilometer, sure enough, an IED (Improvised Explosive Device) detonated, sending scolding shrapnel through both my legs, my right arm, and the right side of my head and neck. The artery in my right foot was severed but it wasn’t long before “dustoff” (or a Medevac) came to rescue me out of there and fly me to the nearest base for medical attention. I should also tell you that I have no regrets about that day, and if I could do it again I would, in a heartbeat, because of one very important thing that the Generals knew as well as I do now: there must be something beyond one’s self. Since that time I have learned to walk again, use my right arm and hand again, and have just recently finished my master’s degree in business administration. I now live in Texas, but have not forgotten the profound effect your picture had on me the first day I saw it. I can tell you quite frankly that I was never much of a crier before, but since the day I was wounded I have been brought to tears, not for myself but for all those others whom I could no longer protect, more times than God could count. I have seen Soldiers and Marines give sight, limbs, memory, unburned skin, restful nights of sleep, pain-free lives, and so much more. I know why the Generals were brought to tears Mr. Kunstler, because their eyes laid witness to the dichotomy of service and sensibility, that there was no glory in any regard including that in the service of Providence, and that the benefits of their actions would never outweigh the costs. 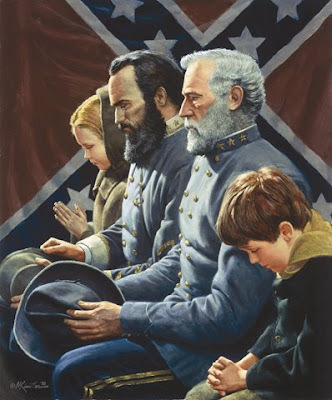 I have come to accept these as truths, and I see myself sitting beside the Generals, beside your grandson Tommy, and beside a flag that may always change color and pattern, but never virtue. I sit beside them all, as a ghost among many, clinging to the hope that humanity will learn the lesson which resides in the eyes of your work, in the eyes of the Generals.